Examine Robert bolt's use of stage setting and the character device of the &quot;common man&quot; in his play &quot;A man for all seasons&quot; - What is Bolt's purpose in using these and how successful do you think he is. Examine Robert bolt's use of stage setting and the character device of the "common man" in his play "A man for all seasons". What is Bolt's purpose in using these and how successful do you think he is? The character, the common man is like the narrator, he is similar to Shakespeare's character 'chorus'. They are different in the way the common man acts different characters throughout the play. The common man narrates the story in parts and makes a link with the audience. Shakespeare's 'chorus' simply acted as a commentator throughout the play, he did not act any characters out. Chorus did not take any active part in Shakespeare's play. The common man appears in the play as different characters and will occasionally comment on the action, which is going on in the play. Bolt's stage directions are very specific and they are also long. The scenery is changed in full view of the audience, this uses the idea of the alienation effect. 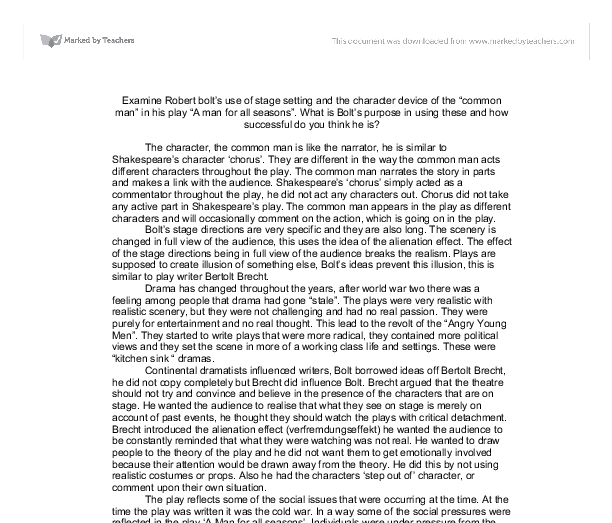 The effect of the stage directions being in full view of the audience breaks the realism. Plays are supposed to create illusion of something else, Bolt's ideas prevent this illusion, this is similar to play writer Bertolt Brecht. Drama has changed throughout the years, after world war two there was a feeling among people that drama had gone "stale". The plays were very realistic with realistic scenery, but they were not challenging and had no real passion. ...read more. In Act one the common man appears on the stage with a property basket. This straight away stops the audience from thinking that what's going on is real because they can see where all the costumes are. The common man is dressed in black, at this point he has no real character, he needs a costume to give him an identity, this is as if the property basket controls him. The idea of the property basket on stage makes it all unreal, normally in a play the actor would come onto the stage in character and costume so the audience would believe what they saw. "I need a costume. (Takes out and puts on the coat and hat of a STEWARD) When the common man puts on the hat and coat, this shows the alienation effect. The audience has seen the common man change into a different costume and character, this means they know it's not real, already the audience wont get emotionally involved. Although Bolt doesn't want the audience to get emotionally involved he said of the common man, "He is intended to draw the audience in not thrust them off it." He wants them to get involved with the social and political issues raised within the play, he wanted the audience to leave the play with critical thought of the social and political points in question. The common man is everybody and nobody, he is powerless but also has no responsibility, for example in Act one the common man is in character as Mathew and is being paid ...read more. When the curtain rises the stage is in darkness save for a spot, front stage, in which the common man. He carries the book, a place marked by his finger, and wears his spectacles' The idea of a spotlight just on the common man, emphasises him, here he is not really playing any main character. "The interval started early in the year 1530 and it's now the middle of May 1532 (Explanatory) Two years." In this part he is explaining what is going on in the play, this in a way kind of shows the alienation effect because only a little while ago the common man was a publican, so the audience don't really know who is and so can't believe what they see. I think bolt was successful with his play because he kept constantly reminding the audience that what they were seeing was not real by using the common man as many characters, and the change of scenery, props and costume which happened in front of the audience. Bolt also had the common man 'step out of' character at the beginning of Act two and comment on the situation. Bolt makes us aware that we need people like Thomas More to make the difficult decisions for us, and give us a moral example. We know we often can't make those decisions but an example like Thomas More is set to enrich us all. Overall Bolt was successful in this play, he didn't copy Brecht's ideas exactly but he used the alienation effect, and I agree that Thomas More's moral standpoint was worth writing a play about. ...read more. bag, which were a rare delicacy in Russia so gave a good insight into Prinze Kazbaki's luxurious life and explained the large belly. When Bryan Pilkington ate he stuffed the food selfishly into his wide mouth filling it so his cheeks were bulging and food was dripping from his lips onto the floor making him look exceedingly greedy and impolite. against Cleon, that he intends to come back at him with a vengeance. There is a lot of slapstick comedy in the play that the audience can relate to such as Procleon making mischief whilst drunk and trying to sneak away from Anticleon underneath a donkey (like Oddeyseus and the cyclops). How is the Common Man presented in A man for All Seasons? The Common Man uses a light-hearted chatty style, at the beginning of the play; he uses comedy in the play, which tackles some serious issues. In this first scene he uses the image of walking on naked, but again the image has meaning. He is prepared to risk his reputation for money "Honour? Tut, a breath; There's no such thing in nature." Through his use of asides, Jonson creates an intimacy between the audience and Volpone, such as the comic exchange with Corbaccio: "Ay, his last sleep, if he would take it." 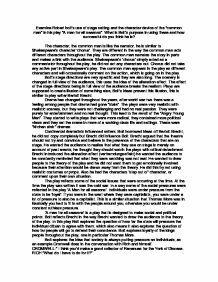 This could be Brecht's method of conveying to the audience the lack of underlying themes or subplot within the play. It could also be his way of showing the rise of Hitler to be an extremely obviously uncontested event, as without subplot, the surface plot seems extremely clear. Gladiator chapter 4 -The after war party. father and daughter. An over the shoulder shot shows her coming over to him, and then an over her shoulder shot of her kissing him, showing that they are in deed close and are father and daughter. And a shot reverse shot of their conversation.